A lot happened recently in the social networking arena. Google plus arrived. After the epic failures of Buzz and Wave, the search giant has come up with something that may actually rival fb. Do you remember something called MySpace? Well, it was sold at a loss of over $500 million. Interesting to note that MySpace at its peak was worth $50 billion and it was sold for a mere $35 million! The arrival of Google+ sparked the idea to carry out a simple social networking test. 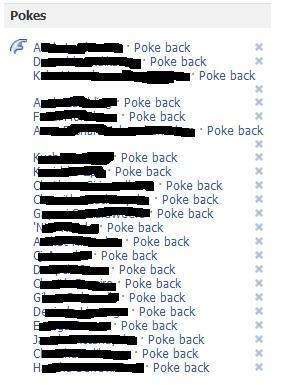 I wanted to test whether people still use the “poke” button on FB. That is if they ever did use it in the first place. So, I went ahead and “poked” about 200 friends on FB. When I say friends here, it means FB friends which include family, people I’ve known for nearly 3 decades, people I’ve met for 5 seconds, people I’ve only ‘met’ online, teachers from school days, students in my tutorial classes, work colleagues etc. So I just “poked” a bunch of them at random to see what sort of reaction(s) I get. All in all, it can be said the people still use the utterly pointless feature of “poking” on FB. I really couldn’t see why this feature was in FB. But it is one of the few features that has survived the many many changes that FB has gone through. Maybe Mark Z is a big fan of “poking” people in real life! Speaking on social networking, check out this vid. Did you poke me too? I can’t even find a poke button.